On the vertical axis is the share for a given language, and on the horizontal axis is that language’s rank, or popularity. From looking at this data, you can see that the #1 most popular language had roughly 30% market share in 1995 but that gradually declined over the past 20 years to roughly 10% today. Perhaps the most interesting aspect of this data is that the decline appears to be slowing. Every 2½ years, the share decreases a little bit less, particularly in contrast to the enormous shifts in the ’90s and early ’00s. 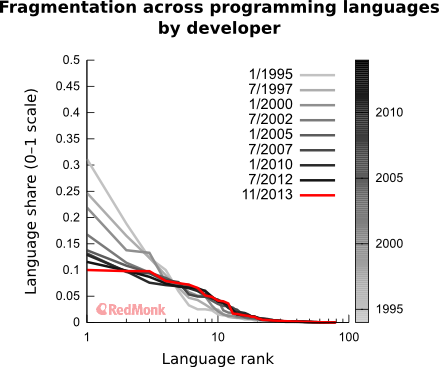 This suggests that we may be nearing peak fragmentation for programming languages, with the potential of a backswing. One last note is that the mid-tier languages (around ranks 5–15) appear to be defragmenting over time. In other words, while the top 5 are spreading out, the next 10 appear to be congealing, with the lower-ranked languages in that range losing popularity. Disclosures: Black Duck has been a client.